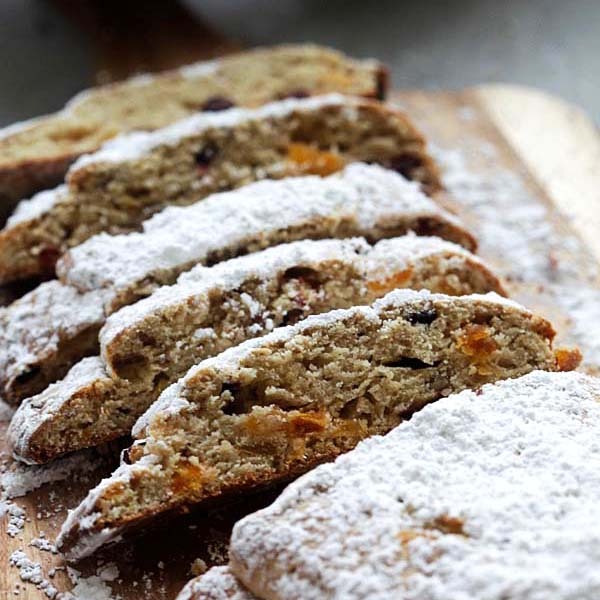 Holiday Bread - delicious homemade holiday bread recipe loaded with pecans and dried fruits. This bread is all you need for holidays! It’s that time of year again as the season of joy, festivities and good times is upon us. This is the season for celebration, family gathering where the loved ones get together and spend quality time with each other. This is the happiest time for home cooks like me as we plan our holiday menu. I plan to make our holiday mornings extra-special with a homemade holiday bread, which is a quick version of the traditional sweet bread. The bread tastes and smells like Christmas and it’s great with either tea or coffee. The best thing of all, holiday bread can be made ahead of time and can be frozen up to a month, which means that I can start baking now. This year, I plan to get little G involved in the baking process. Little G is 7 years old now and he loves baking and playing with dough, especially rolling out the dough on my kitchen counter top. With Little G’s participation in this year’s holiday baking, cleaning has become my top priority. I often use my kitchen counter top for food prepping, such as slicing raw meat. My countertop also tend to be the dirtiest near the sink area because I often wipe it with sponges and cleaning cloths that have a lot of bacteria. To set the stage for our little holiday baking project, I choose Clorox® Regular Bleach2 with CLOROMAX™ as the all-purpose cleaner for my kitchen countertop (check out this amazing video on How to Sanitize Your Countertops). Disinfecting the work space will make sure that little G and I are not spreading germs by cooking on a dirty countertop, and that I will be at ease when rolling out the dough on the surface so everyone will be able to enjoy our homemade holiday bread on Christmas morning! This is my holiday bread recipe. It’s never too early to start baking as this holiday bread makes a great gift for friends and family. With the holidays around the corner, do remember that food safety is important and Clorox® Regular Bleach2 with CLOROMAX™ can be used in the kitchen (and entire house) for disinfection and general cleaning. Disclaimer: This is a sponsored post by Clorox®. The text and opinions are all mine. 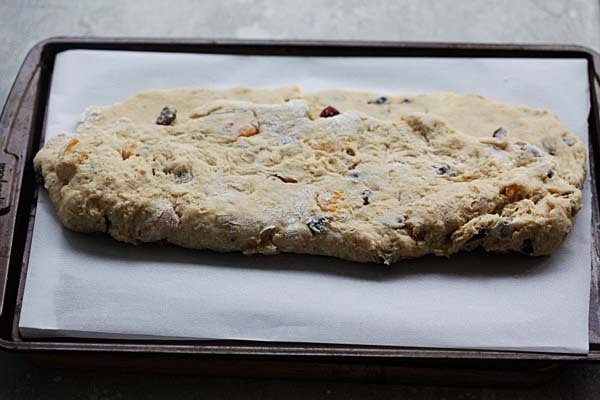 Place the dough on prepared cookie sheet. Bake 55 to 60 minutes or until toothpick inserted in center comes out clean. Transfer the dough to wire rack; cool completely. Sprinkle with powdered sugar to coat just before serving if you like. All photos and recipes on Rasa Malaysia are copyright protected. Please do not use the photos and recipes without prior written permission. If you wish to republish this recipe, please rewrite the recipe in your own words instead of copy and paste and link back to //rasamalaysia.com/holiday-bread/. Thank you very much! Gracias, todas deliciosas. Feliz Navidad. I love, love your Recipes. My family thinks I get all my Asian food from the restaurant, to which I tell them nope. It’s Rasa Malaysia. Thank you for making me a great cook.